You must make an appointment if you wish to view venue. 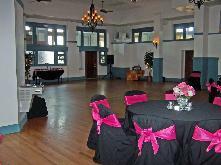 The mission of the Greenville Rotary Post Office Foundation, Inc., is to preserve a historic building by utilizing it as a central meeting place for clubs, organizations and citizens. This building is typical of the Classical Revival style of architecture which James Knox Taylor, Supervising Architect, favored in 1910, when the original building was completed. It was the only monumental building in the city at the time, and as such added greatly to the architectural character of the downtown area. Following its construction, other monumental buildings were built, but even today the structure remains the prime example of this style. It has had such influence, in fact, that a new Public Safety building, currently under construction, contains many of the same design elements - 95 years later! In 1929 an extension was made to the north which enlarged the work space and dock facilities. The materials and architectural detail of the original building were matched - except for the roof. Many other government agencies were also located in this building over the years, including the IRS, Farm Credit Administration, and Army recruiters. It was at this post office that Audie Murphy, the most decorated soldier of World War II enlisted on June 20, 1942. All postal facilities were relocated in 1970 to a newer, larger building. The other federal agencies also moved out at the same time. The building was turned over to the City of Greenville in 1973. The city used it for a variety of offices, cutting up the main sorting room and the entrance halls into small cubicle like offices. Luckily many of these "temporary" walls were put in with a minimum of damage to original windows and wainscoating. It appears that great pains were made to cut around window ledges and the original wall decorations. 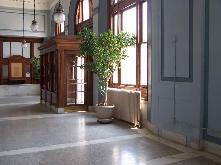 In 1974 the building was entered into the National Register of Historic Places. Hunt County took possession in 1991 and used it for Adult Probation. In 1999, the county moved out and the property sat vacant until 2004. The County Commissioners had no luck selling the building to a developer and accepted the proposed revitalization plan put forth by members of the Greenville Rotary Club and conditionally deeded the building to the Greenville Rotary Post Office Foundation, Inc. The condition was that the Foundation had to demonstrate that the restoration would be feasible. On October 10, 2005, the County Commissioners finalized the transfer congratulating the Foundation on its progress with the landmark. 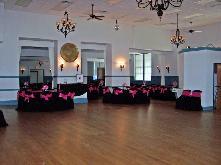 Banquet hall as seen from Lee Street entrance.